My mind is still bursting with excitement from a recent trip Norah and I took to the Knitter’s Review Retreat in Canandaigua, New York. The retreat is held once a year and run by a team of amazing women. There was so much to take in from the weekend, I feel I could write a book, but today I will try my best to focus and talk about just three of the inspiring women. 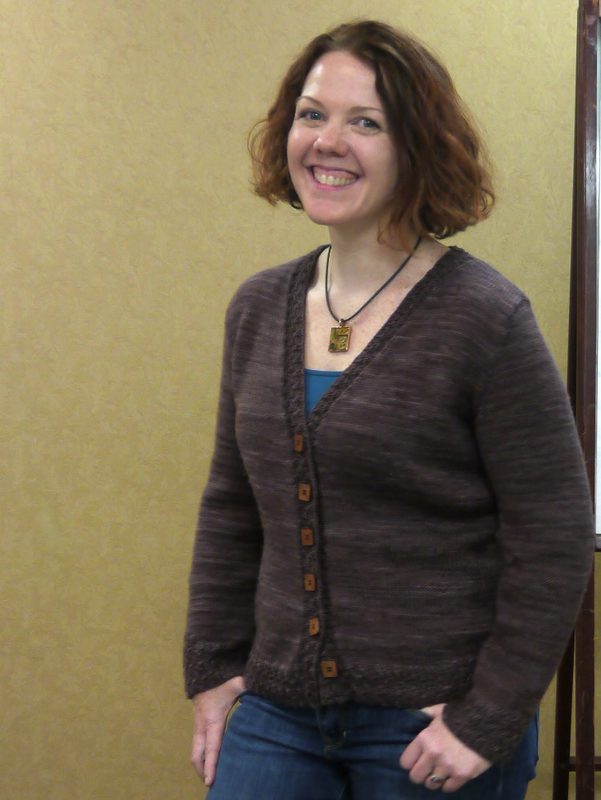 Clara Parks, author and creator of Knitter’s Review, (also author of The Knitter’s Book of Yarn, The Knitter’s Book of Wool, The Knitter’s Book of Socks, and most recently The Yarn Whisperer: My Unexpected Life in Knitting) is responsible for bringing together fiber enthusiasts from across the country for this special yarn-filled event. 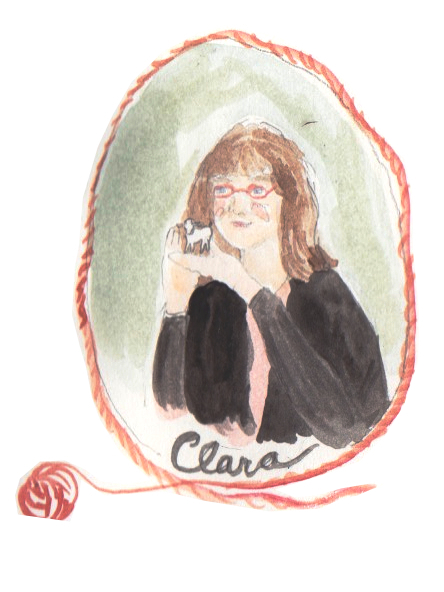 For those of you who are not familiar, Knitter’s Review, is an online publication bursting with information about all things yarn, knitting and fiber related – all charmingly delivered by Clara. Her passion and philosophy for fiber, yarn, where the materials come from and why we knit, is incredibly inspiring. I look to her writings when I feel lost or frustrated with my work. Her wit and insight leads me back, reminding me of why I fell in love with textiles in the first place. Last January, Clara started a project called The Great White Bale. Throughout the year, she has documented her journey across the country, experimenting with different ways of production, twists, spins, and fiber combinations. And it has ended yet. A few of my fellow retreaters were even wearing projects made from Clara’s bale. A knitter proudly wearing Lot 1 of the Great White Bale! On the first night of the retreat, I stood in the back of the room, taking in all of the bustling women. They were excitedly screaming, hugging and knitting together as the caught up on the past year. 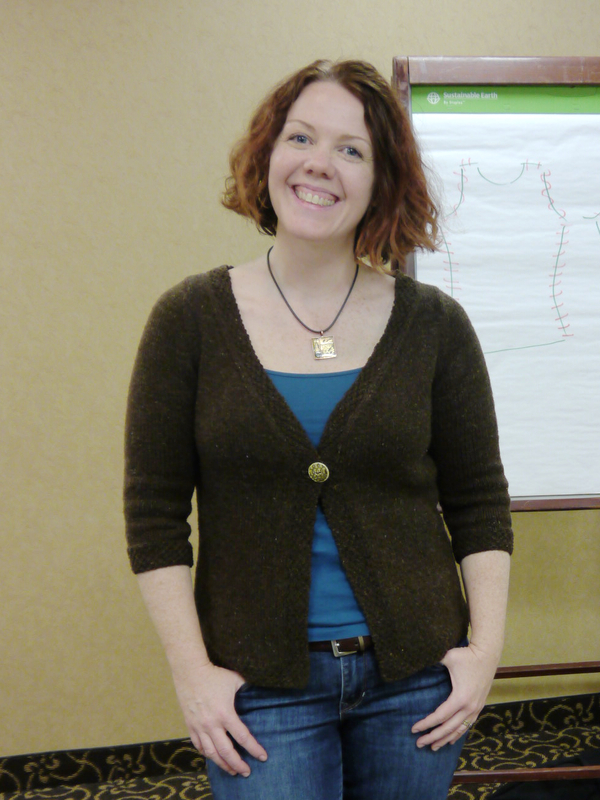 I was immediately welcomed by a group of knitters who could tell I was a “first timer” to the retreat. 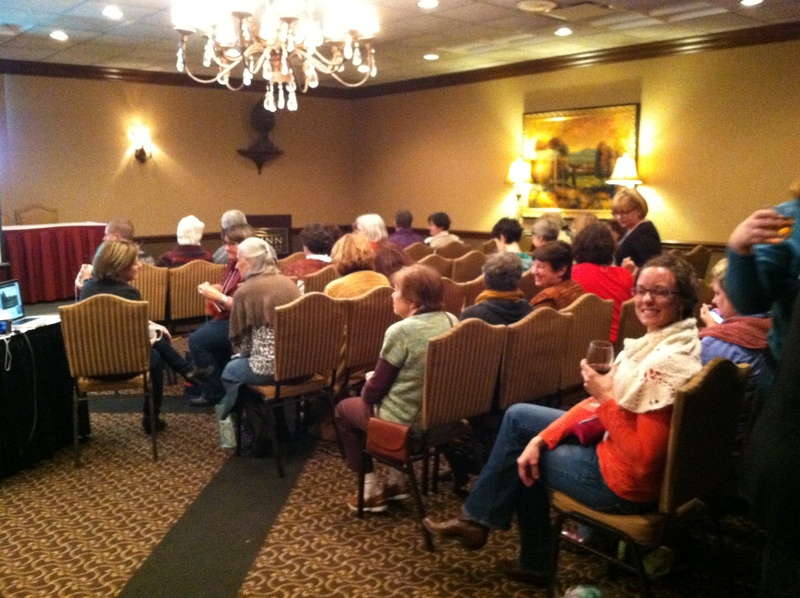 I joined them, with my knitting in hand, to listen to the evening’s guest speaker, Barbara Parry. 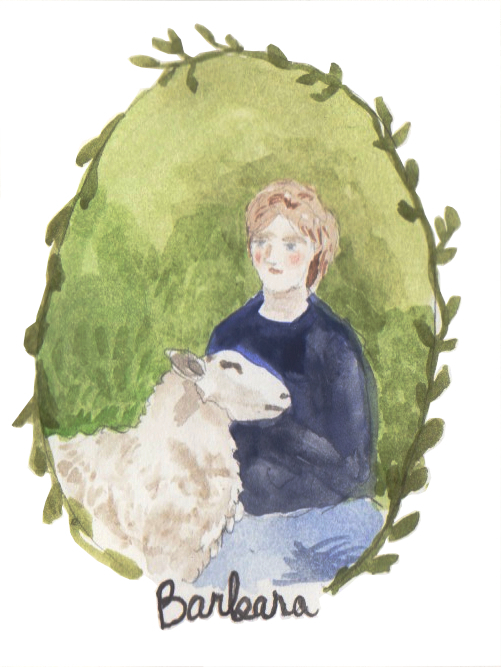 She talked about life on Springdelle Farm where she raises beautiful sheep. It was an interesting lecture full of beautiful photographs and stories daily life with her flock. I had the chance to peek through her new book, Adventures in Yarn Farming: Four Seasons of a New England Fiber Farm, and I was completely captivated. I think that even a city knitter would find it enjoyable to read, getting a glimpse of where our precious yarn starts from. 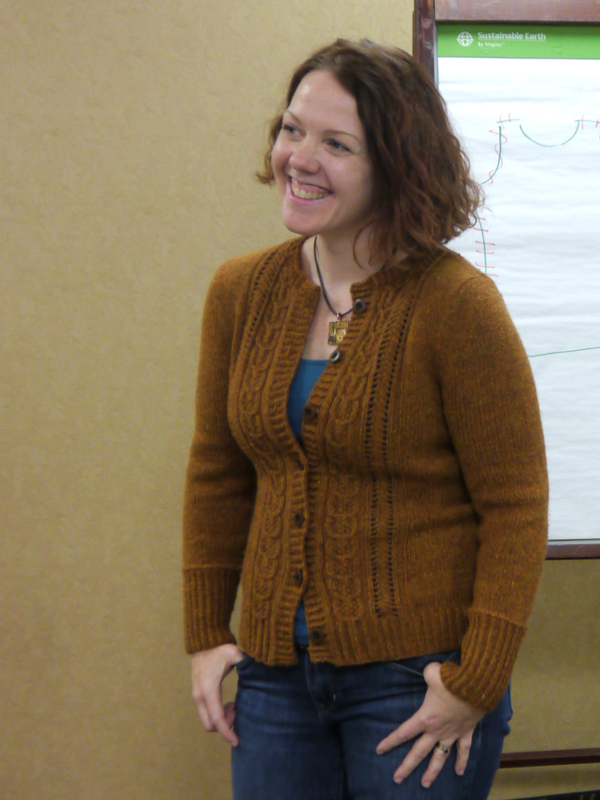 I took a few classes during the retreat and I especially enjoyed Amy Herzog’s class, Fit to Flatter, which focuses on knitting garments custom to our own bodies. Many of you probably know Amy from her fabulous book Knit to Flatter, but you might not know that she’s created a companion website, MakeWearLove.com, that helps create a sweater pattern, just for you! The class was so informative and Amy helped us each measure ourselves so we can apply her techniques to our own knitting. Who knew a class that involved measuring my hips would be uplifting! 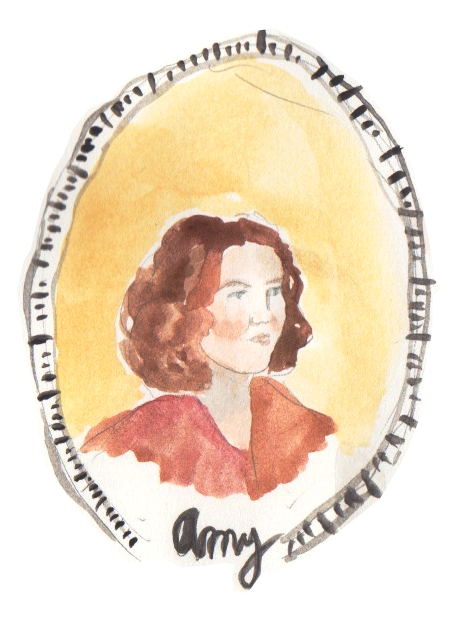 Amy encouraged everyone in the class had to find parts of their bodies they truly loved. After all, when you’re comfortable, you’re confident and confidence is beauty! Amy modeled three designs that were made custom to her body. She looks great in all of the sweaters, even though they each have a different amount of positive ease. It was such a fun weekend. I hope I can go back next year for more inspiration! 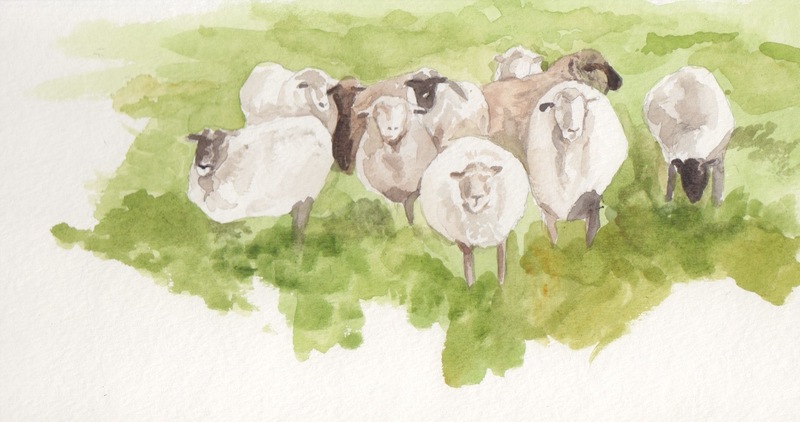 Thank you Emily for more lovely watercolors along with a.colorful, informative story! Fabulous watercolor illustrations! I LOVE the portraits! Thanks Amanda! We miss you! Emily – So lovely to meet you at the KRR! Charming watercolors. You and Norah have a standing invite to make a field trip to my farm, anytime. Have a wonderful Thanksgiving. Oh my goodness we would love that! And it was so wonderful meeting you too.